I feel like I am forever testing products to find the holy grail items that will basically get rid of my eczema completely. Although I know this isn't going to happen. A product is not going to cure my eczema, but I'm still looking hard for those few that will at least help too soothe and avoid future flare ups. You can read about the other products I use to try and control my eczema here and here. 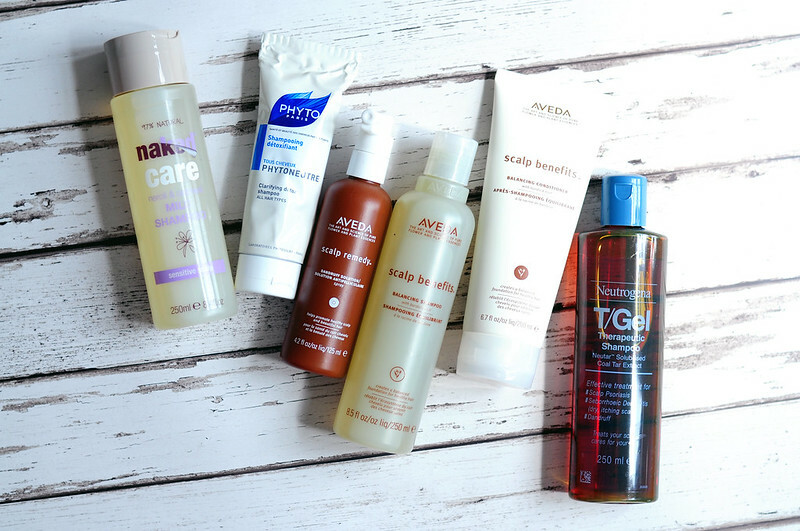 Over the past couple of weeks I've found some new products to try and see if they work or not. Naked Mild Shampoo // I discovered this shampoo just as the brand completely disappeared and it is no longer available. Luckily I snapped up what looks like the last of them for £1 each from Boots. I think I ended up with five which will last me long enough to find another shampoo I like. This is exactly as the name suggests, it's a mild shampoo that doesn't irritate my sensitive eczema prone scalp. Phyto PhytoNeutre Clarifying Detox Shampoo | £12.50 // I've heard quite a few people mentioning this detox shampoo recently and quite rightly, it's really good. It smells minty which I love and it just works. It removes product build up without completely stripping your hair and leaves it feeling clean and refreshed. I use it every few washes or as and when I need it and it's really made a difference to my scalp. I have gone through it quite quickly which is the only downside. Aveda Scalp Remedy Anti Dandruff Solution | £22 // I bought this at the same time as the Scalp Benefits Shampoo and Conditioner despite not reading any reviews on it. I am yet to use it so if anyone has then let me know. Aveda Scalp Benefits Balancing Shampoo £18 & Conditioner £21 // Jen wrote a whole post about sensitive scalps and mentioned this shampoo and conditioner duo from Aveda so I thought I'd try it. I've only used the conditioner so far which I really like and I'm hopeful about the shampoo. Neutrogena TGel Therapeutic Shampoo | £6.99 // I've heard other people rave about this shampoo but I haven't been quite brave enough to try it just yet. On the packaging is a list of reactions that may occur when you use this and although I know it is unlikely I will react to it, I'm still apprehensive about trying it. If you've tried it then let me know what you think of it. It's the tar in this shampoo that is meant to be really good at calming the scalp down and stopping it being itchy and flaky. New products for me to try then! Ironically, the Naked Gentle products had something in them that made my scalp itch even more than usual! oh no! Both the shampoo and conditioner are working well for me at the moment. What shampoos do you use?? I have a horrible eczema and T-gel is amazing for my scalp. Everyone in my family also has dry and sensitive skin, and we all swear by it. Even my grandmother uses it! Whenever I switch to something else I end up regretting it. The weird smell and icky color are totally worth it if your scalp isn't painful and inflamed. I also have a lot of luck rinsing my hair with a mixture of water and a little apple cider vinegar (another odd smelling remedy!! ).